[S27] John Wright Boyd, A Family History: Lt. Thomas Fortson (1742-1824) and Some of His Descendants—Early Settler of Elbert County, Georgia (Danielsville, Ga.: Heritage Papers, 1973), p. 232 (naming Charles Hardman Fortson as her father). [S901] Elmhurst Cemetery, Elbert County, Georgia, online http://ftp.rootsweb.com/pub/usgenweb/ga/elbert/cemeteries/…, (giving only the year). [S312] Social Security Death Index, online at http://tinyurl.com/AncestrySSDI, viewed on 25 Dec 2003. [S901] Elmhurst Cemetery, Elbert County, Georgia, online, above. [S312] Social Security Death Index, online at http://tinyurl.com/AncestrySSDI, viewed on 25 Dec 2003 (stating that she died in May 1978). [S27] John Wright Boyd, A Family History: Lt. Thomas Fortson (1742-1824) and Some of His Descendants—Early Settler of Elbert County, Georgia (Danielsville, Ga.: Heritage Papers, 1973), p. 233. Marriage*: He married Sarah Wesley. Marriage*: She married Wiley Baxter Johnson. [S961] Find A Grave, online at http://www.findagrave.com, memorial for Roscoe Llewellyn Eavenson, memorial no. 77307330, viewed on 12 Apr 2015. [S27] John Wright Boyd, A Family History: Lt. Thomas Fortson (1742-1824) and Some of His Descendants—Early Settler of Elbert County, Georgia (Danielsville, Ga.: Heritage Papers, 1973), p. 235. [S27] John Wright Boyd, A Family History: Lt. Thomas Fortson, etc., above, p. 235 (naming Roscoe L. Eavenson as his father). • His Find A Grave memorial, which includes a picture of his tombstone, is http://www.findagrave.com/cgi-bin/fg.cgi?page=gr&GSln=Eavenson&GSiman=1&GScid=36702&GRid=77307331&;here:WEB. [S27] John Wright Boyd, A Family History: Lt. Thomas Fortson (1742-1824) and Some of His Descendants—Early Settler of Elbert County, Georgia (Danielsville, Ga.: Heritage Papers, 1973), p. 235 (naming Roscoe L. Eavenson as his father). [S961] Find A Grave, online at http://www.findagrave.com, memorial for John Henry Eavenson, memorial no. 77307331, viewed on 12 Apr 2015. [S27] John Wright Boyd, A Family History: Lt. Thomas Fortson (1742-1824) and Some of His Descendants—Early Settler of Elbert County, Georgia (Danielsville, Ga.: Heritage Papers, 1973), p. 235 (naming Stockton Cobb Hudson as his father). [S27] John Wright Boyd, A Family History: Lt. Thomas Fortson, etc., above, p. 235 (naming Louisa Dye as his mother). [S961] Find A Grave, online at http://www.findagrave.com, memorial for Stockton Madison Hudson, memorial no. 44205382, viewed on 12 Apr 2015. [S961] Find A Grave, online at http://www.findagrave.com, memorial for Stockton Cobb Hudson, memorial no. 53405208, viewed on 12 Apr 2015. [S27] John Wright Boyd, A Family History: Lt. Thomas Fortson, etc., above, p. 235 (naming Stockton Cobb Hudson as his father). Other Names*: Louise Dye, Louise Martha Dye Hudson, Louise Dye Hudson, Louise Martha Hudson, Louise Hudson, Louisa Dye, Louisa Martha Hye Hudson, Louisa Dye Hudson, Louisa Martha Hudson, Louisa Hudson. [S961] Find A Grave, online at http://www.findagrave.com, memorial for Louise Martha Hudson, memorial no. 53405216, viewed on 12 Apr 2015. [S756] Dianna Heavilin, family group sheet, 6 Jul 2002 (naming Isaac Zirkle as her father). [S756] Dianna Heavilin, family group sheet, 6 Jul 2002 (naming Elizabeth Mingle as her mother). [S756] Dianna Heavilin, family group sheet, 6 Jul 2002 (giving the date but not the place). [S756] Dianna Heavilin, family group sheet, 6 Jul 2002 (naming Isaac Zirkle as his father). [S756] Dianna Heavilin, family group sheet, 6 Jul 2002 (naming Elizabeth Mingle as his mother). [S756] Dianna Heavilin, family group sheet, 6 Jul 2002. [S756] Dianna Heavilin, family group sheet, 6 Jul 2002 (naming John William Zirkle as his father). [S756] Dianna Heavilin, family group sheet, 6 Jul 2002 (naming Anna Rodecap as his mother). [S312] Social Security Death Index, online at http://tinyurl.com/AncestrySSDI, Cassel Zirkle, viewed 16 Jul 2003 (giving the date but not the place). [S312] Social Security Death Index, online at http://tinyurl.com/AncestrySSDI, Cassel Zirkle, viewed 16 Jul 2003 (not naming the place of death but stating that he lived in Greenfield, Ind. when he died). [S756] Dianna Heavilin, family group sheet, 6 Jul 2002 (naming John Byron Greenstreet as her father). [S756] Dianna Heavilin, family group sheet, 6 Jul 2002 (naming Jennie Leiter as her mother). [S312] Social Security Death Index, online at http://tinyurl.com/AncestrySSDI, viewed 16 Jul 2003 (giving the date but not the place). [S756] Dianna Heavilin, family group sheet, 6 Jul 2002 (naming John William Zirkle as her father). [S756] Dianna Heavilin, family group sheet, 6 Jul 2002 (naming Anna Rodecap as her mother). [S312] Social Security Death Index, online at http://tinyurl.com/AncestrySSDI, viewed 16 Jul 2003. [S756] Dianna Heavilin, family group sheet, 6 Jul 2002 (giving only the year). [S312] Social Security Death Index, online at http://tinyurl.com/AncestrySSDI, viewed 16 Jul 2003 (not naming the place of death but stating that she lived in New Castle, Ind. when she died). [S1321] Iowa Territorial Gazette and Burlington Advertiser, Burlington, Iowa, online archive at http://www.genealogybank.com, 15 Dec 1838, p. 3 (death notice for Mrs. Mary Delashmutt) (not giving the date; naming her as consort of William Delashmutt). [S854] David Haase, Selected Families and Individuals, online, above (naming Van William DeLashmutt as his father). [S854] David Haase, Selected Families and Individuals, online, above (naming Van William DeLashmutt as her father). 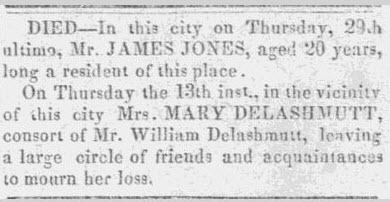 Death notice for Mrs. Mary Delashmutt, Iowa Territorial Gazette and Burlington Advertiser, Burlington, Iowa, December 15, 1838. Other Names*: Mary Ankrum Delashmutt, Mary Delashmutt. [S1321] Iowa Territorial Gazette and Burlington Advertiser, Burlington, Iowa, online archive, above, 15 Dec 1838, p. 3 (death notice for Mrs. Mary Delashmutt). [S1321] Iowa Territorial Gazette and Burlington Advertiser, Burlington, Iowa, online archive, above, 15 Dec 1838, p. 3. [S854] David Haase, Selected Families and Individuals, online, above (naming Mary Ankrum as her mother). [S1395] The Sioux City Journal, Sioux City, Iowa, online at http://www.newspapers.com, 4 Feb 1890, p. 4, col. 5 (obituary of Elias N. Delashmutt). [S1395] The Sioux City Journal, above, 4 Feb 1890, p. 4, col. 5. 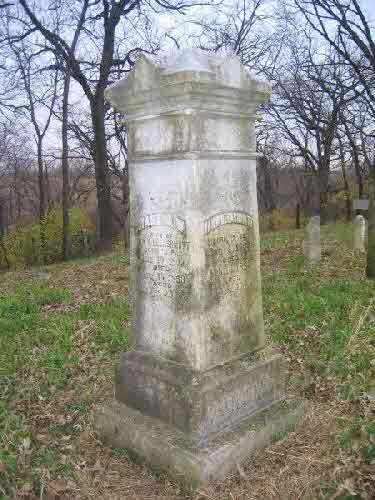 Van DeLashmutt's tombstone, DeLong-Delashmutt Cemetery, Garfield Township, Mahaska County, Iowa, from findagrave.com, by Sharon Welch. [S961] Find A Grave, online at http://www.findagrave.com, memorial for Van B. DeLashmutt, memorial no. 44323650, viewed on 4 Jul 2011. [S1431] The Iowa Daily State Register, Des Moines, Iowa, online at http://www.newspapers.com, 18 Apr 1873, p. 4, col. 4. [S854] David Haase, Selected Families and Individuals, online http://www.haase.org/pafg30.htm (naming Van William DeLashmutt as her father). [S1432] The Iowa State Register, Des Moines, Iowa, online at http://www.newspapers.com, 7 Sep 1886, p. 2, col. 2 (first bullet). [S1433] The Morning Democrat-Gazette, Davenport, Iowa, online at http://www.newspapers.com, 8 Jan 1889, p. 4, col. 5 (second bullet). [S28] James Alonzo Matthews, Jr. and Lucille Pearce, comps., Pearce, Bartlett, Matthews, Smart, and Allied Families (Austin, Tex. : Eakin Publications, Inc., 1983), p. 116 (naming Larkin A. Pearce as her father). [S28] James Alonzo Matthews, Jr. et al., Pearce [etc.] and Allied Families, above, p. 116 (naming Margaret Fuella Frame as her mother).